Born 1911 (d. 1990) in Sumter, South Carolina, moved to the state of New York. Although we have one solitary piece of Inez Nathaniel Walker's work, somehow it seems appropriate. She spent a portion of her life imprisoned for killing a man that abused her. Much of her life was sad and solitary. Her work is represented by no less than eight dealers in the states including Ames Gallerie in Berkeley, California, Phyllis Kind Gallery in New York, and Webb + Parsons in Burlington, Vermont. Pat Parsons and the Webb's have even provided work pertaining to Inez Nathaniel Walker for the archives at the Museum of American Folk Art in New York. Walker's work is also in the permanent collection of the National Museum of Art, Washington, D.C. among over two hundred seminal works from the Chuck and Jan Rosenak Collection. Her work is also there as part of the noteworthy Herbert Hemphill Collection overseen by Lynda Roscoe Hartigan. 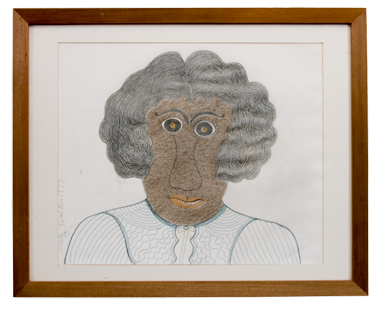 The Santa Fe, New Mexico, Museum of International Folk Art, the St. James Place Folk Art Museum, and Miami University, Oxford, Ohio have Walker's work in their permanent collections. The Milwaukee Art Museum also includes Walker's work in their permanent collection after their 1993 exhibition "Common Ground/Uncommon Vision" from the collection of scholars and collectors Michael and Julie Hall. Our work was purchased from the unfortunate closing sale at Only Artists in Cincinnati, Ohio. One of the original owners had moved to Atlanta, Georgia, and the passion and energy had been transferred to two dynamic women in their footsteps; Kymber Henson and Annie Jansen who not only supported Only Artists in OTR but both lived in the historic district of Over the Rhine. We had begun traveling and purchasing work from auctions of seminal collectors and collections. Our wishes and the hopes of others regarding their success were sincere. Their imminent closing resulted in a sale of remaining works including the piece in our collection by Walker. We will always remember the context under which we were able to purchase this work signed Inez Walker and dated 1977. It is a piece which to us personifies poignancy both on the part of Inez Nathaniel Walker but also related to the closure of yet one more avenue for the recognition of the art of the intuitive, the self taught and outsider.